Albany Station as the Coast Starlight makes a stop one day last year. Faster and more frequent passenger train service up and down the Willamette Valley may be a distant dream, but the planning work grinds on. ODOT’s passenger rail program has just published a comparison of all the existing and potential stops. In Albany, the report compares the existing depot, Albany Station, with a potential stop near I-5. That’s because two routes for the improved service are still under consideration. 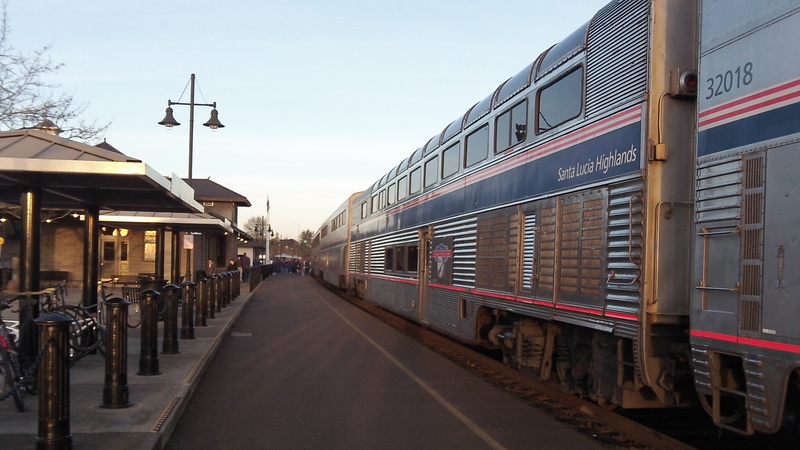 Last December, the Oregon Passenger Rail Leadership Council recommended to the Federal Railroad Administration that both route options get more detailed study in the draft environmental impact statement. One route option would follow the existing alignment on the Union Pacific line, which would require “major infrastructure investment,” as the ODOT team puts it. The other would follow Interstate 5 from Eugene-Springfield through Albany to Keizer, the Oregon Electric line from Keizer to Wilsonville, and I-5 from there to Oregon City, where it would merge with the UP line. The study of stations, published in May, compares them based on operational feasibility, customer demand, site suitability and interconnectivity. It says that Albany Station downtown is closer to more people and employees than a station on I-5 would be. The environmental review process has been going on since 2011. ODOT says it will lead to “the selection of a preferred passenger rail route, identification of general station locations and on-time performance goals,” among other things.